In 2015 my blogging was dominated by Glow Blogs and WordPress. This year the picture was a little different. Here is a Wordle of my 2016 titles. WordPress stays near the top and Glow Blogs featured quite often but not in the titles of the post. 23 Things, Open (including OER16) and Edutalk stand out. 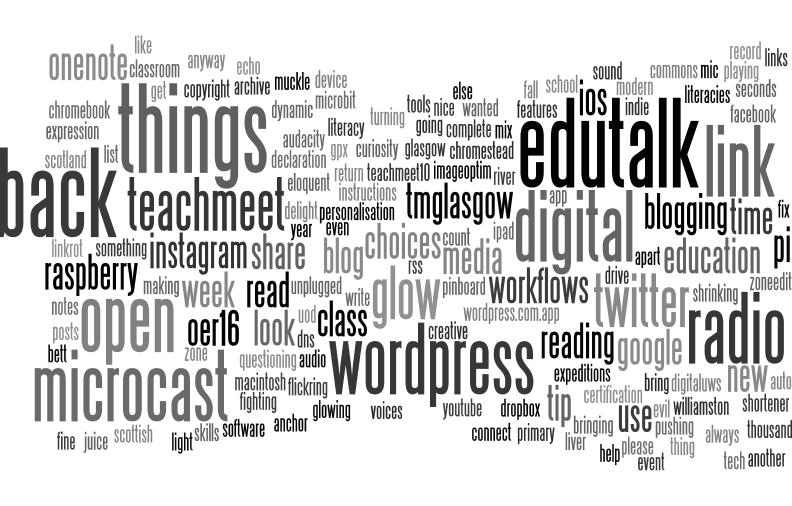 Most of my time in 2015 was taken up by Glow Blogs, 2016 brought big changes, before I’d got used to being back in my substantive post, supporting ICT in North Lanarkshire, I found myself being redeployed into a class teachers role. I’ve not blogged much about that, sticking to technology: some in the classroom, some more general. The post Questioning Glow got most reaction. A fair number of posts are under the 23 things banner and I’ve become even more interested in thinking about the the way that using software affects us. I think the questions I talked about at Always on (them): Digital and Social Media use in Education #DigitalUWS are important. Apart from my Radio Edutalk contributions, which slacked a bit this year I made several microcasts here. There are just short, unedited podcasts, in my case posted from my phone. I doubt that many were listening but I enjoy the format. My most popular post was An interesting mix: Chromebook and Raspberry pi. This was a passing interest as I no longer have access to a chromebook. 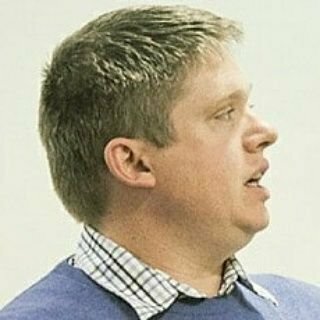 I did blog a fair bit about my Pi(s) which continue to interest me. As I prepare for think about my 13th year blogging, this blog continues to meander through topics that take my fancy, often it feels like me alone. I often read about how to make your blog more popular, and continue to break most of that advice. Featured image: A quick gif made for #tdc1818 The End is Near! Make a GIF | The (new) Daily Create, I’ve not created as much as I would have liked for the daily create, but I still recommend it as a great exercise for playing with digital and your imagination.